I don’t normally do collages with text on them, but this one required a bit of explanation. 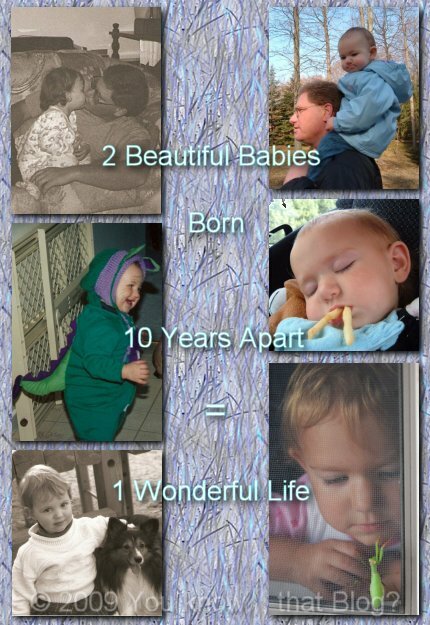 I tried to find pictures of my daughters around the same age for a “comparison” collage. The daughter on the left is of course “The Teen”, and the daughter on the right is “Wee One”. In October of this year, they will be 15 and 5 respectively. They missed being exactly 10 years apart by 9 days. .-= sharon´s last blog ..[mosaic monday] what is it? =-. .-= prof en retraite´s last blog ..Mosaic Monday/Outdoor Wednesday…or…A Fairy Ring =-. They certainly favor! Very cute girls…. My daughter is 13. Time flies, doesn’t it? .-= Roban´s last blog ..Mosaic Monday: Reflecting on Our Words… =-. Your babies look great – that last photo is amazing! .-= Iva @ Horizontal Yo-Yo´s last blog ..Book Banter: My Sister’s Keeper =-. .-= Shannanigans´s last blog ..Skunk Juice =-. great idea for a mosaic! great comparison! Time does fly! You have beautiful daughters! Love the comparisons — simply lovely. .-= Claudia@DipityRoad´s last blog ..Promise Yourself =-. Both of my parents had siblings about ten years younger. They were and are much loved. .-= Becky K.´s last blog ..Mosaic Monday…Flower Close-ups =-. .-= Riet´s last blog ..Mosaic Monday =-. .-= Regina´s last blog ..Nature Scenes =-. What beautiful girls! It is amazing how fast time passes when we look at our children! .-= Lola England´s last blog ..Summer in the Valley =-. Oh how sweet! what a great idea to do this! Your daughters are beautiful. What treasures. .-= Cass @ That Old House´s last blog ..It’s The Dreaming Spires on Mosaic Monday =-. .-= storyteller at Sacred Ruminations´s last blog ..Mosaic Monday – Lazy Dayz at Home =-. Aww that’s so sweet. Beautiful mosaic. .-= jeanne´s last blog ..Flowers – Mosaic Monday =-. that is a really fun mosaic and the text really did help ~you are one lucky momma! Wow – that’s amazing! Very sweet photos and collage. .-= RobinfromCA´s last blog ..BLUE MONDAY & MOSAIC MONDAY =-. Oh what a lovely mosaica and what a lovely family . Thanks for sharing. .-= ellen b´s last blog ..Mosaic Monday ~ Summertime… =-. Yes, McDonald’s fries that her big sister kept putting in her mouth as we were driving ;) One of my favourite pictures of her from that age! You have two lovely daughters. Beautiful mosaic and love the last pic! .-= Ebie´s last blog ..My World: Natural History Museum-Rock Formation =-.